We recommend that you purchase Sunex® Tools product from an Authorized Distributor to ensure warranty support and service. Sunex® Tools assumes no service liability for product purchased from an Unauthorized Distributor. To register your Sunex® product click here. Sunex® Impact Sockets are warranted against defects in materials and workmanship for the life of the product. This includes driveline sockets and super reducers. This warranty does not apply to items that have been misused, abused, altered in any way, or worn out from use. Some Adapters (1805, 2301, 3305), Reducers (4301,5303, 5524, 6332), and Extra Thin Wall Impact Sockets (2624, 2617, 2626, 2619, 2628, 2621, 2632, 2622, 2634,2623, 27-6, 2708, 2710, 2712) are sold with out of box warranty. Super Reducers however are covered under the Lifetime Warranty for impact sockets. Sunex® Hand Tools are warranted against defects in materials and workmanship for the life of the product. This includes wrenches, screwdrivers, pliers, bit and socket sets, pry bars, pullers, and drive tools. Sunex Tools® sockets are clearly marked with the material from which they are manufactured. Sockets intended for use with hand operated tools are made from Chrome-Vanadium Alloy Steel. These sockets also under lifetime warranty but are not designed for use with impact tools of any kind. Doing so can cause serious injury and/or void the warranty on these sockets. Sunex Tools® Torque Wrenches carry a 90-Day Warranty. During this warranty period, Sunex Tools® will repair or replace at our option any part or unit which proves to be defective in material or workmanship. Bit sets including but not limited to 9726, 9732, 9729, 9734, and 9735 carry a limited lifetime warranty which covers any defects in workmanship or materials for the life of the product. This warranty does not cover failures due directly or indirectly to misuse, abuse, negligence, accidents, normal wear and tear, improper repair, alterations, or lack of maintenance. 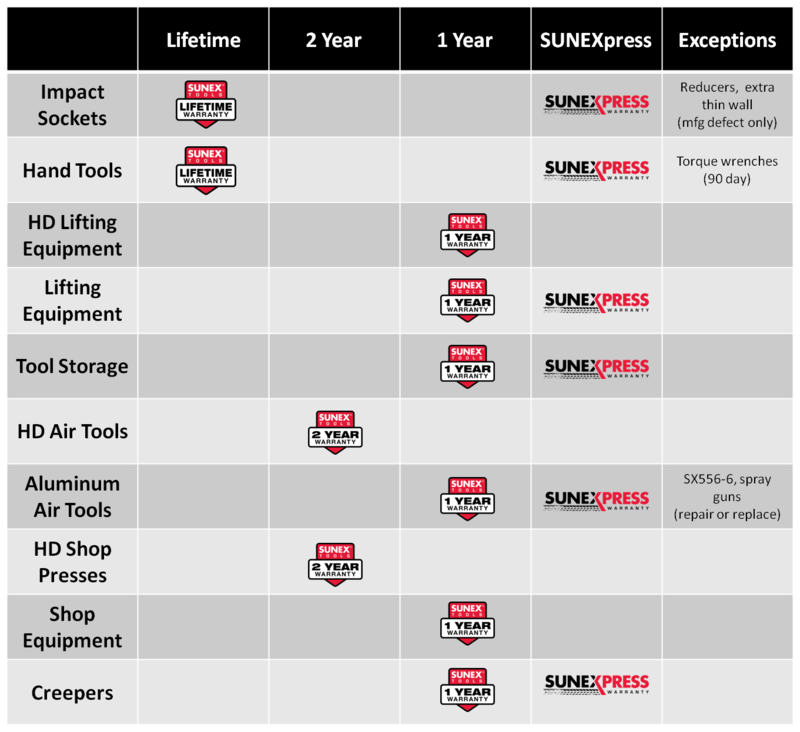 Sunex® Lifting Equipment carry a One Year Warranty. During this warranty period, Sunex Tools® will replace any unit which proves to be defective in material or workmanship. All floor jacks 3.5 ton in capacity and under will be replaced under the SUNEXpress™ Warranty. Sunex® HD Air Tools carry a Two Year Warranty. During this warranty period, Sunex Tools® will repair or replace at our option any part or unit which proves to be defective in material or workmanship. Sunex® Aluminum Air Tools carry a One Year Warranty. During this warranty period, Sunex Tools® will replace any unit which proves to be defective in material or workmanship through the SUNEXpress™ Warranty. Sunex® Spray Guns and Spray Gun Accessories carry a 90-Day Warranty. During this warranty period, Sunex Tools® will repair or replace at our option any part or unit which proves to be defective in material or workmanship. Sunex® HD Shop Presses are Made in USA and carry a Two Year Warranty. During this warranty period, Sunex Tools® will repair or replace at our option any part or unit which proves to be defective in material or workmanship. Sunex® Bench Grinders and Drill Presses One Year Warranty. During this warranty period, Sunex Tools® will repair or replace at our option any part or unit which proves to be defective in material or workmanship. Carts & Creepers carry a 1 Year Warranty. During this warranty period, Sunex Tools® will repair or replace at our option any part or unit which proves to be defective in material or workmanship. 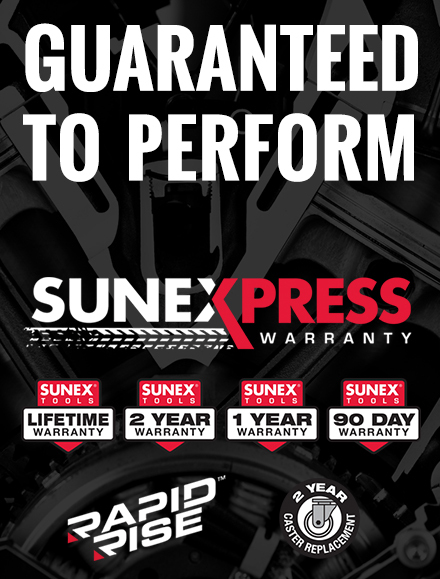 In addition, during this warranty period we will replace any wear and tear part through the SUNEXpress™ Warranty. This includes gas shocks, drawer slides, handles, and casters.